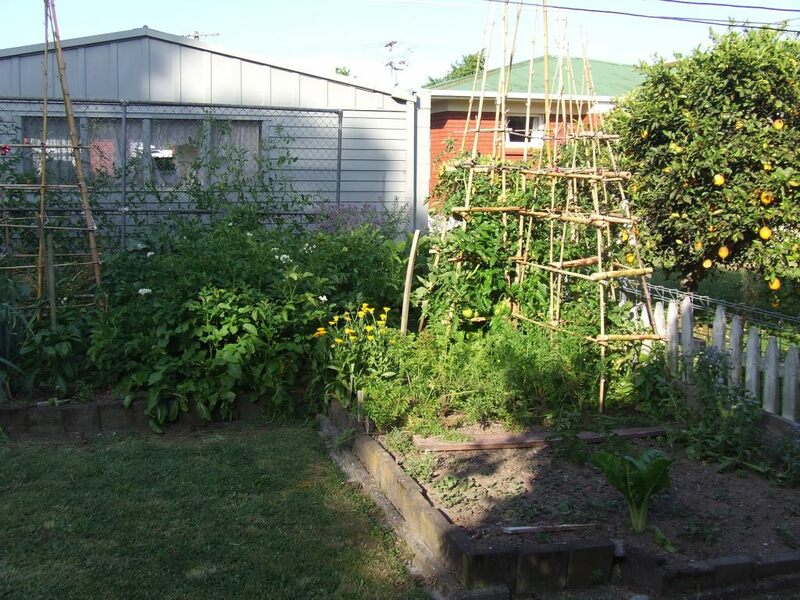 What’s Going on in That Vege Garden? 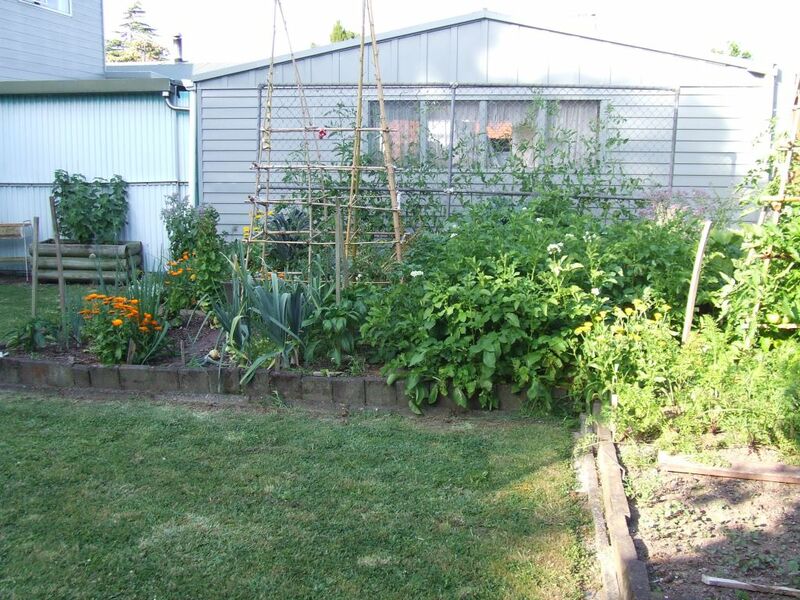 The fruits of the bigger tomato varieties are still green at the moment, but most of the plants have been rocketing away, especially the ones along the carport. I pinched the tops out once they reached the top of the carport, which is just over 2m high. The tomato plants reaching above the carport. There has been an extreme amount of plant tying going on. 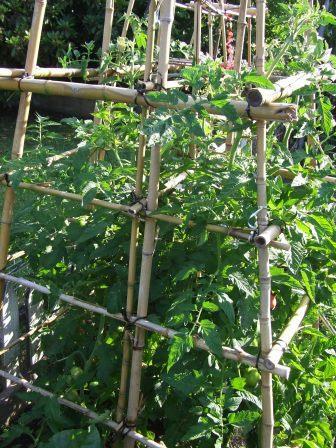 I have 17 tomato plants, 11 of which need tying. With three main stems each, that’s 33 ties for each tying sesh. Except when I’ve been busy or slack, then it’s even worse! I ran out of material ties pretty quickly, so resorted to buying these McGregor’s soft twist ties, available at Mitre10Mega or Bunnings. I would rather not buy plant ties, but things were getting ridiculous. These twist ties can be cut with scissors, are easy to twist around the plants and are reusable. I started off with the 5mm, 5m long size, then moved to the smaller, 10m size to make them go further. Time will tell how well they hold up the fruiting plants. Some of the Amish Paste plants have blight, but I’m trying to keep it under control. The Black Krims next to them seem happy as Larry. Who is Larry anyway? The ‘Small Fry’ cherry tomatoes have been quite disappointing. They were pretty slow to get going and now some have blight and two have what I’m pretty sure is cucumber mosaic virus (CMV), due to the characteristics of leaf discolouration, stunted growth, and, most distinctively, shoe-string-like stems with tiny leaves. These two will be making a quick exit into the rubbish bin. Some of the cherry tomatoes have ripened and they’re not exactly the greatest in the world eating-wise either. Ah well, I’ll make sure I do more than one variety next year. One of my cucumber plants on the carport wire fence is doing very well and we have been enjoying the first cucumber in wraps and salads. They have tough, bumpy skins so need to be peeled, but they are quite tasty. The next cucumber is just about ready. A cucumber on the way. Pumpkin Corner is pretty nuts, as always. In a good way. I can hardly take a photo of it now because the pumpkins are still trying to take over the world. There are some decent-sized pumpkins growing in there, which is exciting to watch. This is the first time I’ve grown pumpkins due to The Husband’s apparent dislike of them. Pumpkin corner from the other side. The borage plant growing in there is so happy and is the most ginormous borage I’ve ever seen. The capsicum plants are plodding along nicely. Well, I think they are. This is the first time I’ve grown capsicums too. The wee fruits have started to appear. Ooooooh. Capsicum ‘Purple Beauty’ – the first wee fruit. The kale forest is still alive and kicking, with only one plant gone to seed. It just keeps going! It’s like the energizer bunny. This is a good thing, as my lettuce succession planting didn’t quite pan out over the holiday period. In other words, there is currently a lettuce drought. Kale and rocket have been keeping our wraps very tasty (and nutritious). The potatoes are still gunning for it, with no signs of losing steam either. The kale forest, with potatoes on the left. All sounds and looks delicious!! Thanks! It’s so great being able to eat stuff fresh from the garden again.